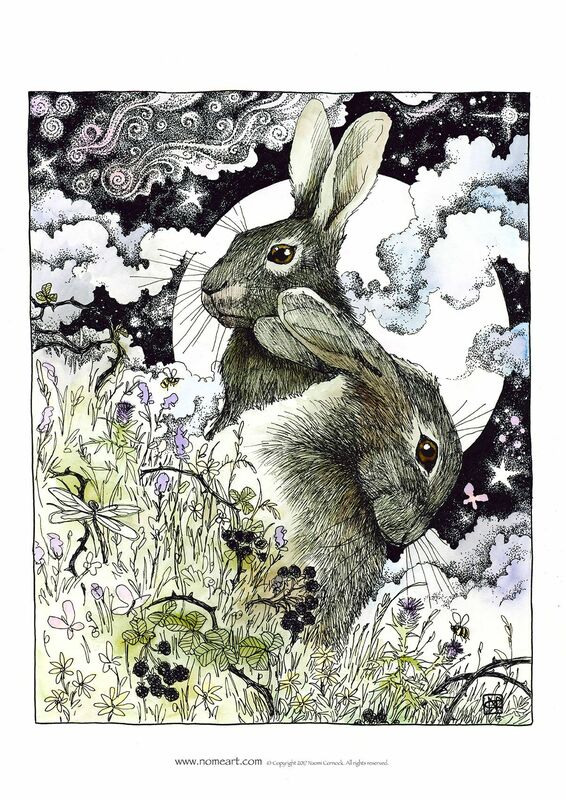 The Hare is often associated with moon deities and signifies rebirth and resurrection. It is an animal spirit found in many different pagan pantheons across the globe. Native American lore portrays Rabbit as a trickster, known as Manabozho, or Great Hare. In some stories the Great Hare created the world, brought humans fire and even taught shamans how to enact sacred rites. 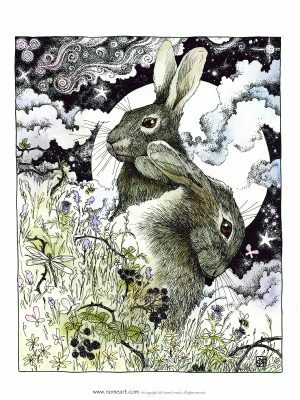 In Celtic paganism the Hare is associated with the Goddess Eostre (from whom Easter gets its name), a moon goddess associated with the reborn earth and fertility. In early Chinese mythology the hare was a symbol for resurrection. Also said to represent peace and tranquility, and has been regarded as an auspicious animal. This may be the reason for its use in the decoration of the Mogao Caves on the Silk Road. In fact the Chinese don’t refer to ‘the man in the moon’, they refer to ‘the hare in the moon’. This hare in the moon is said to pound the herb of immortality. In India there is a similar legend and in addition the hare figured as a sacrificial animal that offered itself to be burnt in order to provide food for Brahman. In ancient Egypt the figure of a hare was used as a hieroglyph which denoted existence.